I'm scraping in with a day to spare in the Tim Holtz 12 Tags of 2014 challenge for April. Mainly because I don't have most of the supplies Tim used, so inspiration wasn't forthcoming for most of the month. But I'm determined to complete all 12 tags, so it's a case of using what I've got, and substituting with the nearest thing. I'm also entering it into Simon Says Monday Challenge Mellow Yellow. I'm eating out tonight with the girls, so DH is cooking Chinese fried rice for himself. The smell is driving me mad. Very nicely done and a beautiful Tag. Love your color choices and arrangement. Awesome tag Shirley! I have just discovered that my e-mail subscriptions to the Blogger sites that I follow have not been making into my mailbox! So I have missed the past 1 1/2 weeks of your posts! My apologies! I am now off to check out all the yumminess that I have missed! I know I am in for some delightful eye candy! GREAT tag, Shirley! Love it!!! I love your tag too! A piece of art! I especially like that dyes ribbon! This tag is fabulous! I love how the background is a vintage pattern in subtle colors, which makes the textural elements you included really pop! 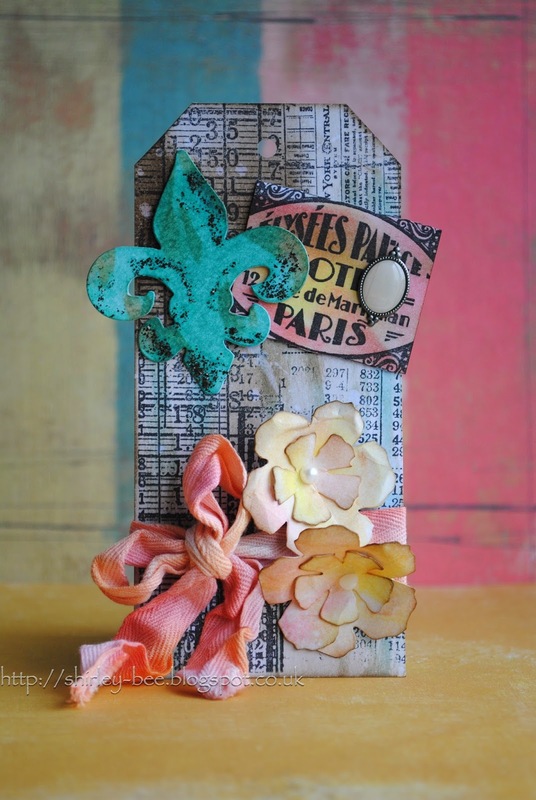 That fleur de lis is distressed so beautifully and I absolutely love the ribbon with all of its pink/orange shades. Great combination of some eclectic elements and I really love the dimension that your flowers add. Thank you so much for sharing this beauty with us for this week's Simon Says Stamp Monday Challenge!